Documentary offers glimpse into a butcher's store where whites, African-Americans, and Hispanics are united by food. 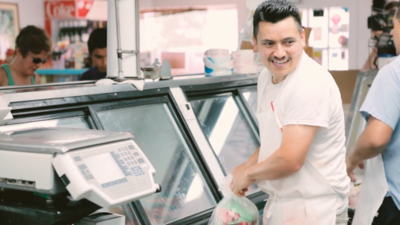 That's how Gerardo 'Tolo' Martínez, a Mexican from Guanajuato, ended up coming to work at Cliff's. The two men are the protagonists of a bilingual documentary short, Un Buen Carnicero (A Good Butcher), by journalist and food writer Victoria Bouloubasis, who filmed their preparation for 4th of July. "I like to use food as a medium," Bouloubasis told CityLab. "Food is a social equalizer and I use it so that people can relate to other subjects." And that is exactly what happens in a shocking way in this documentary, through the events of a busy day preparing food for July 4, which addresses the diversity of southerners, the butcher's craft, immigration and the American Dream. The story tells how Tolo has picked up English accent that he himself describes as "very country," how he learned his trade and how he responds to a new kind of diversity he found in North Carolina. According to the Pew Research Center, the number of Hispanics in Orange county where Cliff's is located, has grown dramatically from just 680 people in 1980 to 11,767 in 2014. "This is where all southerners come to buy their meat and now, with the population change, you see other things: sausage, marinated meat 'al pastor,' limes and tamarind," says Bouloubasis. "For many this is something unexpected in the south, but for me, I've grown up here, it's normal." The film was recorded more than two years ago, but with everything that's happened in the United States over the last year it still resonates strongly, even offering some hope for racial tolerance and integration. "I think many times when we are presented with stories of undocumented people, we expect extraordinary things, but I have a different take, and that is that every human being deserves to be happy, to have a family, to have a dream," according to the director. "Tolo, although he contributes a lot to his community, lives a simple existence and that should be enough."